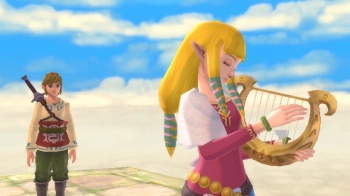 Sometimes, playing the Song of Time on a ocarina just won't cut it. Whether you love the Legend of Zelda games with all your heart or hate them with a firey passion, it's impossible to deny that the series has some of the most recognisable and iconic music in videogame history. You know it, I know it, and Nintendo knows, which is probably why the series' 25th birthday celebrations include a orchestral tour around North America, playing music from all of the games to date. Unfortunately for folks in Dallas, the tickets for the January 10th show are sold out. Conversely, tickets for the Toronto show don't go on sale until March 31st, so you've got plenty of time to save the $50 - $150 the tickets cost. Full details, including how to buy tickets for your concert of choice, are available on the official website, and don't worry if you don't live in any of those cities, as Nintendo says that it will add more dates during the year. With a little luck the tour might even make it to Europe.